Sure, we all know that plastic water bottles are bad for the environment, and are pretty easy to phase out of our daily routines. All it takes is a getting some sort of reusable water bottle, and those are certainly plentiful. Water may indeed be everywhere, but when out in the wild there is usually not a filtered drop to drink. Until now. The Self Filtering Water Bottle from Hammacher Schlemmer is a stainless-steel water bottle that comes complete with an integrated filter. Able to treat up to 100 gallons of water before replacing, the water bottle/filter combination provides the equivalent of 757 1/2-liter plastic bottles. 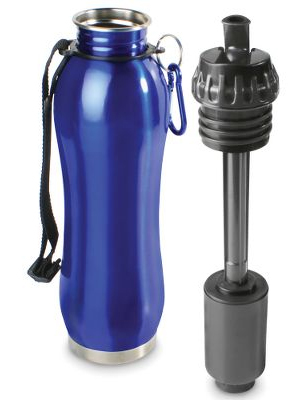 Using adsorption, chemical bonding, and 1/500-millimeter perforations to remove 99.99% of microbes, the water bottle is a convenient accessory for modern life, or even as a means to ensure access to potable water when out on the hiking trail—you know, out in the environment we’re all trying save.